Benjamin Franklin was quite the Renaissance man. Author, scientist, inventor, and oh yeah—Founding Father of our country. It’s amazing the things a guy could accomplish before Netflix came along and got in the way! Seriously though, this man knew his stuff, especially in the world of business and personal finance. We took a deep dive into old Ben’s archives and found a wealth of business intel that still rings true today. If you had brothers and sisters growing up, you can probably relate to the feeling that things were always stretched a little too thin, right? Clothes, meals, what have you. Well, our friend Ben came from a family of seventeen children, all brought up by a simple candle maker in 18th century Boston. At the age of ten, he left the formal education system to go to work in the candle business with his dad. In short, he was far from privileged. A few years later Franklin started working as an apprentice at his brother’s print shop. By 17, he decided to strike out on his own and ran away to Philadelphia to start his own print shop. At the time, he had just three shillings (today’s equivalent of $0.25) in his pocket. How’s that for grit and determination? So how did Franklin become so famous? For one thing, his writing. 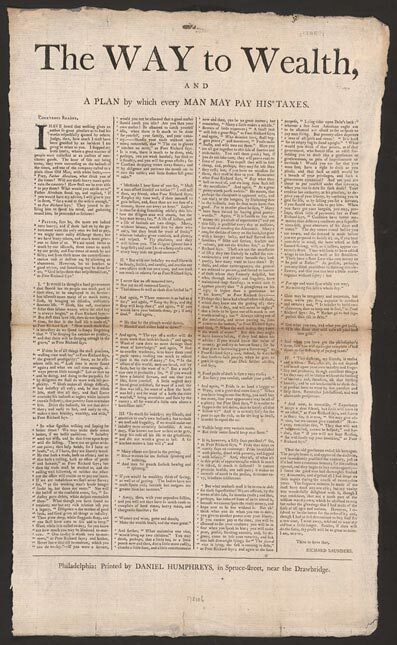 As Franklin’s career as a newspaper editor and printer began to take off, the budding author started recording his tricks of the trade in a publication he dubbed Poor Richard’s Almanack. Writing under the pseudonym Richard Saunders, Franklin shared his wit and wisdom on a wide range of topics—one of the most prominent being money. Nearly 200 years later, Poor Richard’s Alamack remains the source of some of the most well-known and time-trusted advice on business and finance. Here are a few of our favorite Poor Richard maxims you can apply directly to your business. While it’s easy to attribute the success of others to sheer “good luck,” the fact is that in business there’s no such thing. You create your own good fortune, and the harder you work the more of it you’ll have. The most precious resource you have as an entrepreneur is your time. Unlike money or inventory, you’ll never be able to make more of it. Use it wisely. Don’t sit around worrying about your bills. Go out and do something about them (like starting that business you’ve been talking about for ages!). The old-timey equivalent of telling people to stop buying $5 lattes every day. The little things add up and can bleed your cash flow dry. After 25 years of publishing the almanac, Franklin compiled his all-time best advice into a manuscript called Way to Wealth, considered by many as the first American book on personal finance. Way to Wealth has sold millions of copies since its first edition ran off the press in 1758. As any entrepreneur knows, running a successful business is about far more than just money. It’s about values, and how you instill those values into everything from your product to your customer service to your employee culture. Lucky for us, Ben also had the scoop on the values that help a business run as smoothly as his old printing press. Temperance. Practice self-control in what you eat and drink, and pay attention to taking care of yourself. Order. 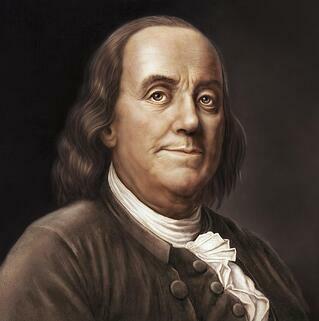 Benjamin Franklin was among the first to point out that a cluttered desk leads to a cluttered mind. Everything in your life should have a place, from that stack of papers to the time you allocate to your family and friends. Resolution. Set goals and don’t give up until you’ve reached them. Frugality. We’re accountants by trade, so this might be our favorite one. Don’t spend money you don’t have, plain and simple. Industry. Instead of sitting around talking about ideas, get out there and make them happen. Sincerity. If you commit to doing something, do it to the best of your ability. Justice. The Golden Rule serves us well here; treat others the way you want to be treated, and always do what’s right. Moderation. Don’t lean too far one way or the other. This applies well to politics, investing, parenting and so much more. Tranquility. Enjoy nature. Embrace peace and quiet. Spend time away from the “hustle and bustle” of it all. Chastity. In a relationship? Don’t window shop. Be loyal and faithful and your relationship will thirve. Humility. It’s okay to have confidence in your abilities, but having an over-inflated ego will almost always do more harm than good. Check your ego at the door. Do any pieces of Ben Franklin’s advice resonate with you? Leave us a comment below and share your favorite. For more wit and wisdom hand-crafted for entrepreneurs, subscribe to our YouTube channel.